Good news everyone! Today we’re launching a big update for Book of Demons and we have prepared something for both newcomers and for already engaged players. This is the biggest update we’ve done so far and it will pave the ground for even better things to come. Intrigued by Book of Demons but haven’t tried it yet? No more excuses now! Offering a demo during early access is something very few developers do, but we’re confident in our game and are working hard to raise the awareness. It’s a kind of experiment for us and we’re very anxious to see how well it goes and what will be its impact on our sales. One of the major complaints we were receiving is that the game is not challenging enough, especially on higher difficulty modes, and that there is not enough incentive to try different card combinations. What we’re launching today is our first attempt to address all of that. From now on, bosses in Freeplay mode will be immune to certain cards, forcing players to adjust their strategy on encounter. This takes advantage of the game’s hallmark feature, a card system that unifies spells, items, skills, and character stats. Additionally, when starting a game on Hard, Nightmare or Massacre, the game will select 2, 3 or 5 cards at random and equip them in a mandatory fashion. This will force players to build a hand around the weaknesses and strengths of those cards for the upcoming game. Imagine such situation: you stumble upon a pack or skeleton archers or other ranged units, so it would be great to swap one of your cards and equip the Shield. 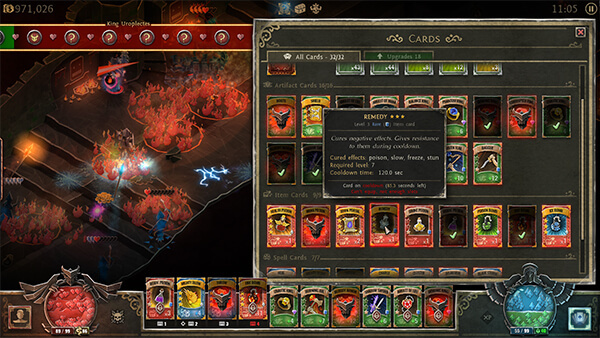 In previous builds, players would rarely change cards during combat, even when encountering a considerable swarm of enemies with certain special abilities. This was because swapping a card takes time, and it’s often better to just push ahead rather than open the cards pane and take the damage while adjusting your hand. With the current update, once you open the cards pane, the game time slows down so that you can make tactical changes and respond to the threat in a better way. Players ready for an even greater challenge can try Daredevil Mode, which adds a brutal permadeath mechanic. Once you die, it’s game over, but the depth you achieved is written to the hall of fame. For now, the hall of fame is local only, but if it works nicely we’ll be enabling Steam leaderboards in the next update! The changes described above are only part of the update. There are hundreds of bugfixes, lots of balance changes and other minor improvements. You can read the whole changelog here or in the game. For those who were waiting for the next character class, we ask you for a bit of patience. It will be included in the next major update, which we’re already working on. If everything goes per plan, it should be ready by the end of November. And it won’t be “just” the new class, there will be a usual bunch of other exciting features we can’t wait to share with you! For now, stay safe in paper dungeons!